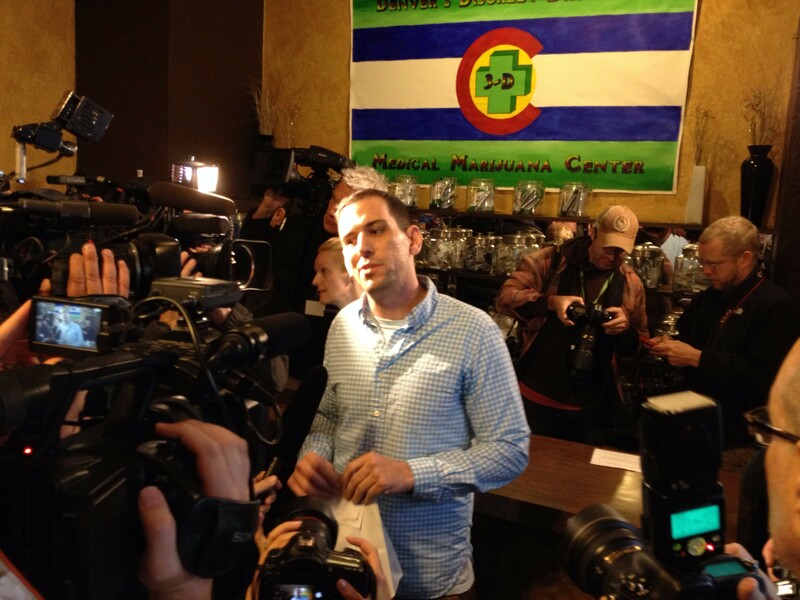 Historic first sales of legal recreational marijuana began across Colorado Wednesday when Sean Azzariti bought the first bag. Azzariti, a Denver-based Iraq war veteran who suffers from post-traumatic stress disorder and could not -- until now -- get marijuana legally to help alleviate his symptoms, made his purchase at an 8 a.m. press event. Azzariti's purchase at 3D Cannabis Center in Denver was $59.74, with tax, for 3.5 grams of Bubba Kush and a bag of pot-infused truffles. Although Colorado has had medical marijuana laws on the books for years, PTSD was not covered under state statutes. Now that recreational marijuana can be purchased and consumed by adults 21 and over, Azzariti can buy it legally. The event at 3D Cannabis Center, one of a few dozen Colorado dispensaries selling recreational pot for the first time, was organized by key Amendment 64 backers Mason Tvert, communications director for Marijuana Policy Project; Brian Vicente, spokesman for Sensible Colorado; and Betty Aldworth, spokeswoman for the National Cannabis Industry Association. "A lot of folks have been referring to what is happening in Colorado as an experiment with legal marijuana," said Tvert to a packed crowd inside 3D. "But, in fact, the experiment was marijuana prohibition and that experiment dramatically failed, just like the so-called great experiment of alcohol prohibition." A line of exuberant prospective marijuana buyers formed around the 3D building in falling snow, eager to join Azzarti and take advantage of Colorado's new recreational marijuana law. “The era of marijuana prohibition is officially over in Colorado,” said Rob Kampia, executive director of the Marijuana Policy Project, in a press statement after sales began. “The state is demonstrating to the rest of the nation and the entire world that regulating marijuana works. Colorado voters approved Amendment 64 in 2012. For more than a year, marijuana consumers have been able to legally possess up to an ounce of marijuana and grow up to six plants for their personal use, but Wednesday marked the first day that they can legally purchase marijuana at a dispensary. CORRECTION: An earlier version of this post understated the amount of pot purchased -- 3.5 grams of Bubba Kush were purchased, not .5 grams.